If holidaying in Crete this year, you may wish to make a visit to the Cretan Runner Museum. The Museum celebrates the life and achievements of George Psychoundakis, and is based in his village of Asi Gonia. It was established by his son Nikos Psychoundakis and grandsons George and Stelios Psychoundakis, in a building built by the late George Psychoundakis himself. The purpose of this museum is to exhibit and share important documents, books, photos, missions with friends and colleagues and other various personal objects of George’s with the public instead of being stored away in cupboards and boxes. A dedication in Greek by Patrick Leigh Fermor with typical seagulls! The museum has no website, but there is a Facebook page with further information. This entry was posted in Uncategorized and tagged Cretan Runner, Crete, George Psychoundakis on March 26, 2019 by proverbs6to10. We have all seen the famous 1972 video of Nico Mastorakis’ TV show “This is Your Life” which brought Kreipe and his old enemies together before the cameras. If you have not seen it you can find it here. In this newly discovered video Nico Mastorakis presents a documentary about the whole kidnap event, and includes full length and exclusive interviews with Paddy and General Kreipe. The General even says that “next year I will spend my holiday in Crete.” I wonder if he ever did? There is much more about the kidnap in the Video and Audio section. Take a visit now. This entry was posted in Ill Met by Moonlight, Video and tagged Cretan Runner, Crete, George Psychoundakis, Greece, Ill Met by Moonlight, Major General Heinrich Kreipe, Patrick Leigh Fermor, William Stanley Moss on June 21, 2012 by proverbs6to10. From the Folio Society website. Ten years ago, The Folio Society decided to publish a book by William Stanley Moss, entitled Ill Met by Moonlight. It told the story of a daring war-time adventure in Crete, in which Moss and Patrick Leigh Fermor, two young SOE officers, kidnapped a German general, spirited him away across the mountains and into captivity. The book was based on the detailed diary kept (entirely against the rules) by Moss, and its undeniably romantic aspects were highlighted when, in 1957, a film was made starring Dirk Bogarde as the dashing Leigh Fermor. When we planned the book, it occurred to us that Patrick Leigh Fermor, known to his friends as Paddy, had never contributed any kind of comment on it in writing. We assumed there was a good reason for this – a certain delicacy perhaps, since, at the time of the operation, he was already embedded in Crete in a cave under Mount Ida, with the role of facilitating Commando raids on the island, and was dependent on the friendship and loyalty of the local partisans. But we wrote to him anyway and asked if he would contribute an introduction. He rang up from his home in Greece. It was indeed, he said charmingly, ‘delicate’ and for various reasons he’d always felt the less said the better. We parted genially, my suggesting that we might ask Michael Foot, historian of the Special Operations Executive and an old friend of his, to do it instead. This we did. A week later, Paddy telephoned again. He’d been thinking about it, and he felt that there were things he would like to say: the coup had, in his view, been diminished by being reduced to the level of a ‘tremendous jape’ and he hoped to restore the balance by providing something of the context for the enterprise. He did not wish to interfere with Michael’s introduction, but would contribute a short Afterword, describing his own experience. It would be 500 to 1,000 words. It eventually emerged at 6,500 words, all of which had to be wrested from him in hand to hand combat, so anxious was he that nothing could be misinterpreted. Michael Foot, in the meantime, was triumphant to be able to tell Paddy that General Kreipe (who was not the intended victim of the kidnap, as that gentleman had been moved on) was so unpopular that, when they heard he had been snatched, his officers broke open the champagne. Most Folio books have their unexpected rewards, but this one had more than most. Through it we met Billy Moss’s daughters who showed us photograph albums and the original diary; Sophie, their Polish mother, a formidably attractive SOE operative who had been based, with Moss and Leigh Fermor, at Tara, the Cairo House; Michael (M R D) Foot, whose own experiences as prisoner of war were at least as hair-raising as the exploits he went on to chronicle; and of course Paddy himself – courageous, witty, modest, famously attractive and – both with this book and The Cretan Runner – a good friend to The Folio Society. We will miss him. This entry was posted in Ill Met by Moonlight, Other Writing, Paddy's Death, Paddy's Friends and tagged Folio Socierty, George Psychoundakis, Patrick Leigh Fermor on March 24, 2012 by proverbs6to10. I was alerted to this interview by Mark Granelli. As ever we have to be cautious about things that may have got lost in translation but I was a little suspicious about this interview as Paddy appears to go further out on a limb than recorded elsewhere. You will understand what I mean when you read it. Is she being totally honest? Mark – thanks for being such a good sleuth! I will put it up but I am slightly suspicious of this one. Paddy appears more political than I have ever read before. Maybe he opened up to her because she is very pretty, if a little thin. But without further ado let’s go to the interview which can be found online at Amalia Negreponte’s website on 20 July 2011 …. Born: In England. First traveled to Greece: When he was 19 years old, in 1935, during his tour of Europe. Main bibliography: “Mani”, “Roumeli”, “The Violins of Saint-Jacques”, “Between the Woods and the Water’, “A Time of Gifts”. Lived most of his life after World War II: In Mani (Kardamyli); frequently travelling to England, where he recently passed away, 40 days ago. He will be remembered by all- and certainly by us Greeks- with gratitude, admiration, love. Five images. A man dressed in a British Army uniform, alone, on a snowy mountain – he is in Albania, in 1941. He speaks fluent Greek. The Greek soldiers endearingly call him “The Englishman”. Whenever he can, he talks of poetry and literature. Second image, the same manly uniformed figure, next to Giorgos Seferis, in Cairo. He has just arrived, right after the tragic Battle of Crete. His sorrow is vividly reflected on his face. Third flash. Haifa, 1942. The officer, the blackboard and the class of uniformed men. It is one of the war lessons the officer with the penetrating gaze gives to the Allies. Crete, 1944:While the British commando takes off the German Army uniform he has deceptively worn, his five Cretan companions and a British officer hold a German officer captive. He is General Heinrich Kreipe – the commander of the German Occupying Forces in Crete – recently kidnapped by the men. On peaceful nights, the captive and the English officer-kidnapper talk of Homer and the great tragedians. Last image: Mani, 1998, in a small cottage. The man sets aside, just for a moment, his writing – the bookcase is full of his highly acclaimed books. His eyes sparkle. “Greece was in danger. She was suffering. I did what anyone else would have done. Nothing more, nothing less”. Without any need for introductions, he is Paddy. Michael. Filedem. Patrick Leigh Fermor. Ramrod-straight, soft-spoken, keeping his youthful impetuousness intact. “Dear God! It was nothing!”, he says every once in a while, with extreme modesty and reserve, as soon as he is reminded of his legendary status and heroic activity. He talks of his books with the excitement of a small child. Whenever he talks of the historical battles – always playing the leading role – he fought in Greece during World War II, he never uses the pronoun “I”. It is always “we”; whether he talks of British soldiers and fellow officers – he keeps mentioning Christopher “Monty” Woodhouse, Xan Fielding, John Pendlebury, the archaeologist-hellenist who died, fighting heroically, during the Battle of Crete – his Cretan companions – George Psychoundakis, Manolis Paterakis, George Tyrakis – or the whole of Greece. We meet Patrick Leigh Fermor in mid-July at his home, in Kardamyli, Mani, where he permanently lives during the last few decades with his wife, in a cottage he built by himself. The 83-year-old Anglo-Irish Fermor, having fought for Greece throughout his life, throughout her difficult moments with vigour, self-sacrifice and passion that transcends heroism; awarded with all the possible military distinctions for his actions in battle; highly valued throughout the world for his books – they are considered “masterpieces” by the most severe European and American critics – and living a reclusive life, exclusively dealing with what he has been dreaming of since he was a child: book writing. At the moment, he is fervently preparing the story of his adventures during the entire war. His achievements are known through official documents (Foreign Office), as well as his companions’ and historians’ memoirs. He, however, has remained silent until now. “Since I was a child, I was determined to become a writer; that’s for sure”, Patrick Leigh Fermor – Paddy, to his friends – remembers. “For that reason – to collect experiences and meet different people and things – and since I wasn’t particularly good at school, I set out, when I was 18 years old, on a journey to Constantinople, a journey that would mark and determine my life”. The journey lasted a whole year and included the whole of Europe. Alone and moneyless, Fermor sailed from England to the Netherlands and went on, through a snowy landscape, to Germany. He followed the course of the Rhine upstream and turned eastwards, towards the Danube. He crossed the borders to Austria and Czechoslovakia. He borrowed a horse in Hungary, crossed Transylvania, Romania and Bulgaria, over the Balkan mountain range and reached the Black Sea coast: Varna, Nesembar and Burgas; then, across the borders of Turkey, towards Edirne. On January 1, 1935, he reached Constantinople. His next stop was Greece. “My love for her was unconditional”. He lived in monasteries of Mount Athos, in Thrace and Macedonia, in Peloponnese and Athens. The few words of ancient Greek he had learnt at school turned, almost magically, to fluent modern Greek and Greece got an eternal hold on him. “And then, around 1936, I returned to England. The months away from Greece seemed intolerable. That’s why when, in 1941, I joined the Intelligence Corps, I asked to be transferred to Greece, fighting at the time against Italy in Albania. It so happened”. And Patrick Leigh Fermor became an integral part of the Albanian Epic. And, right after that, of the Cretan Resistance. From 1941 until the bloody Battle of Crete, Fermor was there, in the first line, along the Cretan warriors who considered him “more Cretan than the Cretans”, he says with pride. “Where can I begin? The long night marches, the growth of the Resistance form village to village, from mountain top to plain? Waiting for boats in secluded coves, waiting for drops of ammunition in plateaus, visiting intelligence gathering networks in cities, sending commandos on sabotage missions, escaping German raids, on the mountains, the eagle nests and the crags we used to live… Since the first Axis invasion of Greece, we English felt that we were allies of the only nation left to fight darkness and tyranny. The rest of the world remained neutral, defeated “in peace” or, worse still, had joined the enemy – through alliances and treaties. When the war came to Crete, the solitary allies – Greece and England – fought hand in hand. And then came 1942. In horror and despair. England was being devastated by heavy bombardments, the Germans were marching at full speed towards Stalingrad, Erwin Rommel’s tanks and canons were hammering our lines in the desert, pushing us back towards our last line of defence, El Alamein; and the USA had not entered the war yet. My men and I, driven out of Crete after the Battle of Crete on May 20, 1941, crushed and shattered, had escaped towards the Middle East. First Alexandria and Cairo. And then Haifa, near Palestine, where I taught allied officers in a war college. What did I teach? The essentials. Secret landings, sabotage, using enemy arms and ammunition, parachute drops, commando raids, evasion tactics, setting mobile radio stations – everything. My heart and thought, however, were with Crete, suffering more than ever. Villages were being burnt. Thousands of Cretans were being taken captive. Inhuman tortures and mass executions were on the agenda every single day. But the Cretans had not given up. They were continuing the Resistance, in any possible way, with vigour and stoicism. But not only that. They were also helping, risking their lives and the lives of their own people, the English allies who had been trapped in the highland villages and mountains of Crete. They were taking care of them as if they had been their own children. It was a great honour. We became and still are the children of the Greek people. I am grateful for that – to be part of such a brave and noble kind of people was the greatest honour for me. We were strangers who came to Greece from afar to take part in the battle, to fight, to shed our blood on your mountains. We, however, risked – of our own accord – our lives, whereas the Greeks who helped us at the time of our greatest weakness did not only risk their lives, but also the lives of their families and the destruction of their villages, their motherland. Therefore, let’s not talk of our own sacrifices…”. “I could no longer resist staying away from Crete – I longed to return there”. Thus, on July 24, 1942, at midnight, he returned from the Middle East to Crete by fishing boat, assigned a special mission in Central Crete. “Hard times. We were cut off from Africa and any supply shipments, whereas the Germans ravaged Crete, killing and torturing civilians whenever the Resistance struck a blow against them. The only good thing for our Crete out of that period, until 1944, was that we were not affected by the Civil War raging in mainland Greece – we were not aware of it”. At the beginning of 1944, Filedem – who lived on the mountains of Crete, organizing the Resistance disguised as a Cretan shepherd – is ordered to return to Alexandria. “I didn’t want to leave”. However, he couldn’t help it. No matter how reluctant he was, Fermor finally left. He returned a few months later as the leader of a highly important mission for Crete in particular and Greece in general: the kidnap of the German military governor of Crete. Unfortunately, the target, General Friedrich-Wilhelm Müller, was replaced by General Heinrich Kreipe just before he arrived. Fermor finally came up with an idea – dressed as a German soldier, he stopped the general’s car on his way home at what was supposed to be a routine check point; the rest of the team took care of the driver and drove the car and the general away – met with success. Hunted by German patrols, the team moved across the mountains and villages of Crete “in order to evacuate our captive safely, making sure that no reprisals were taken against the civilian population”. Whenever he got off the car, Fermor was met with murderous stares and open enmity by the Cretans due to the German Army uniform he was wearing. “I realized then what it meant to be a German. I felt lucky not to be one. Upon arriving in Sphachta, where my friend father Giannis Skoulas lived, his wife came out of their house and stared at me in disgust. Full of joy, I tried to embrace her. Get away! She screamed. It’s me, Michalis, I said. No point… It took some time for her to recognize me and get over the repulsion the German Army uniform was causing her”. The outcome of the mission? General Heinrich Kreipe was sent to Cairo, safe and sound. “We treated him with respect, honour and care! After all, he was our captive”. 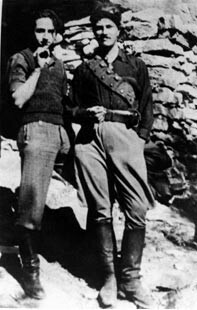 Fermor met Kreipe decades later – to discuss World War II. The atmosphere was genial… “He was well-versed in poetry, Latin and ancient Greek – I realized it when we kidnapped him. We had drunk from the same fountains, we had sprouted out of the same roots, well before the war started – and that changed things”. Even the usual reprisals were avoided. Fermor left a letter to the Germans when he abandoned the general’s car: “Gentlemen, your Commander was taken captive by a British Battle Force under our command (editor’s note: Fermor and Moss). When you read this, the General will be in Cairo. We want to point out that the operation was conducted without any kind of help from the Cretans… Any reprisals against the local population would be unjustifiable and unfair. Auf baldiges Wiedersehen! 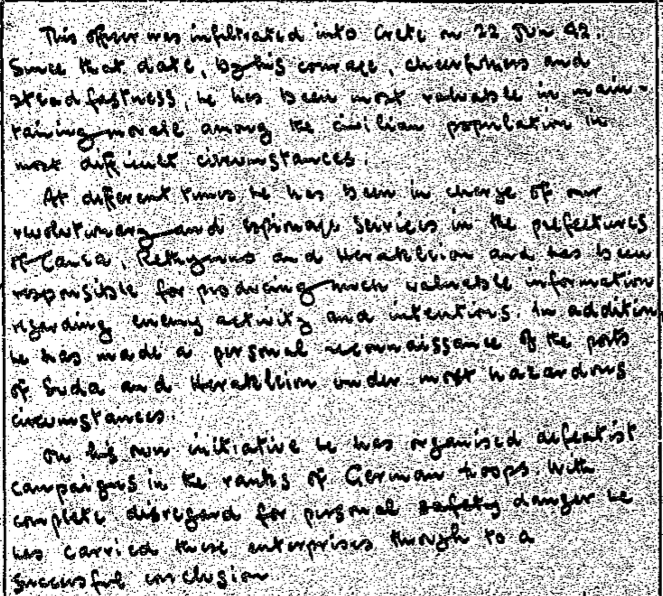 (editor’s note: the two signatures). PS: We are sorry to leave the car”. Fermor (his code names during the war were Michalis or Filedem), who was idolized by the Cretans because he constantly put his life at risk for Greece, seems to have been left alone, a symbol of an era of heroes. He transcends the meaning of the term hellenist; he is a philhellene, with all the idealism and struggle the term includes. He reacts when I ask him whether Greece wounded him. “Of course not! How could she? I devoted my life to Greece; to justice. My success is my greatest satisfaction. I’m hurt when I see people attacking Greece – usually unjustly. I’m hurt when I see strangers treat her contemptuously and scornfully. I’m hurt when they ignore, use and distort history to strike a blow – for example, when they support FYROM. “I don’t want to hear anything more about “bad feelings” of the Greeks towards the Turks. For God’s sake! The Turks seized and illegally occupy Northern Cyprus – it’s a well-known fact. Fewer and fewer Greek are living in Constantinople anymore – as a direct result of the rioting, looting, extermination, murder, coercion and general pogrom they suffer. Europe should never forget what Greece has offered and act accordingly. I’m not talking of ancient Greece; I’m talking of modern Greece – World War II Greece. Greece prevented the whole of Europe from collapsing when the sky blackened. They should all remember what Greece stands for. Because ideas change, people die and monuments collapse with the passing of time. What can’t be destroyed, however, is the spirit of the Greek people – it includes all virtues, it inspires, it shines – just like the light that shines on the Greek mountains: your mountains. Our mountains”. “In 1941, those of us who survived the Battle of Greece fled to the Middle East. First Alexandria and then Cairo. Right there on the bank of the Nile and the city of Alexander the Great, I had the chance to meet and befriend Giorgos Seferis, who had also taken refuge there. His hard features betrayed an anxiety and a sorrow that transcended our everyday stress about the outcome of the war. In the Middle East during that critical phase of the war when everything seemed lost, Giorgos Seferis was giving his personal battle: in politics and letters – poetry”. Seferis wrote the poem “Days of June 1941” when Fermor arrived in the Middle East, right after the Battle of Crete. “The new moon came out over Alexandria with the old moon in her arms while we were walking towards the Gate of the Sun in the heart’s darkness–three friends”. “There are times when I feel I’m still there”, says Fermor. “Feeling the sorrow for my dead companions and the lost battle, seeing that man with the dark eyes driving away the clouds with his words. Just words. Words of an educated and scholarly man who had experienced the horror of broken bodies and the pain of loss”. Fermor takes out an old photograph, depicting the poet and him. Both men are thoughtful. With heavy gazes. “We didn’t stay together long”, Fermor recalls, “I was always on the run – missions and training… “You have to reckon how to move. It’s not enough to feel, to think, to move”, he used to say – exactly the way he wrote. He was always reserved and cautious. He didn’t talk much; you never got tired of listening to him. Modest and discreet. I respected him at the time. I loved him as a poet later. He was educated and had a breadth of knowledge transcending the borders of nations and civilizations. Giorgos Seferis recorded our experiences with accuracy and sensitivity. Yes, we had come from all around the world, as he says in the poem “Last Stop”, “from Araby, Egypt, Palestine and Syria”. Although he was very reserved, he never got detached. You could see the accumulated strength inside him”. This entry was posted in Interviews with Paddy and tagged Amalia Negreponte, Crete, George Psychoundakis, Greece, Mani, Patrick Leigh Fermor, Roumeli, Second World War, William Stanley Moss, Xan Fielding on March 18, 2012 by proverbs6to10. It is clear the original intention was to award Paddy a DSO, but that was struck out in favour of an OBE. Paddy was later awarded the DSO for his part in the Kreipe abduction. 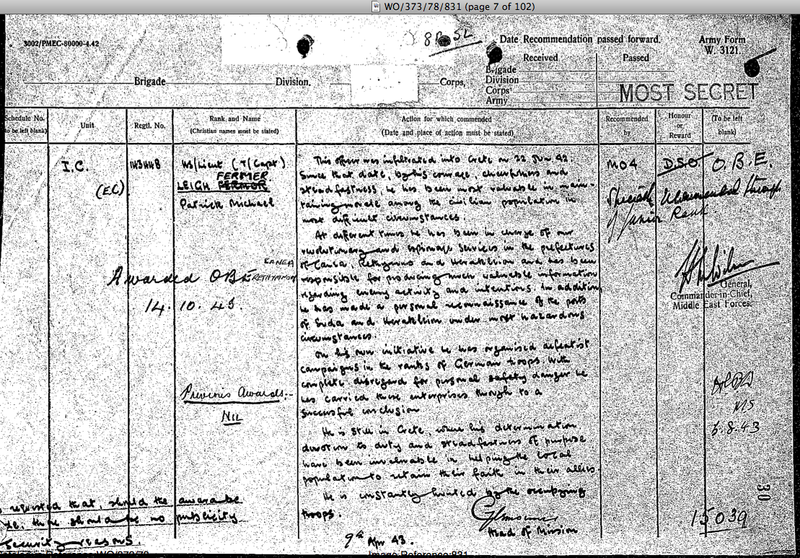 Interestingly they had difficulties with his surname … Fermor is crossed out and replaced by Fermer! This officer infiltrated into Crete on 22 Jun 42. Since that date, by his courage, cheerfulness and steadfastness, he has been most valuable in maintaining morale among the civilian population in most difficult circumstances. At different times he has been in charge of our revolutionary and espionage services in the prefectures of Canea, Rethymnon and Heraklion and has been responsible for providing much valuable information regarding enemy activity and intentions. In addition he has made a personal reconnaissance of the ports of Suda and Heraklion under most hazardous circumstances. On his own initiative he has organised defeatist campaigns in the ranks of German troops. With complete disregard for personal safety … he has carried these enterprises through to a successful conclusion. He is still in Crete, where his determination, devotion to duty, and steadfastness of purpose have been invaluable in helping the local population to sustain their faith in their allies. He is consistently hunted by the occupying troops. Signed by Head of Mission 9 Apr 43. The source for this is the Kew public records office. This is not in Paddy’s SOE file. This entry was posted in Ill Met by Moonlight and tagged Crete, George Psychoundakis, Greece, Ill Met by Moonlight, Major General Heinrich Kreipe, Patrick Leigh Fermor, Second World War, SOE, Special Operations Executive on November 15, 2011 by proverbs6to10.